Nowadays it’s almost impossible to live without your gadgets. All these smartphones, tablets, portable media players and the rest are devices that we can’t afford to part ways with even for a moment. However if you’re the adventurous type who likes going out in the wilderness for some camping fun, then you are probably also familiar with the horrors of range anxiety, as your device battery starts to empy on the journey. 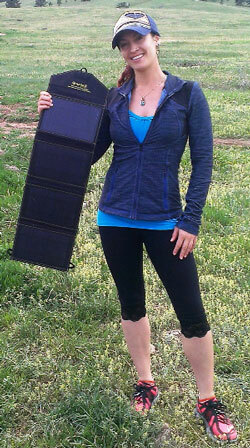 Unless you have the SunJack Phone Portable Solar Charger – the world’s most powerful solar charger, according to the company behind the product. If camping is your favorite activity then this foldable charging wallet could become your favorite camping-buddy. 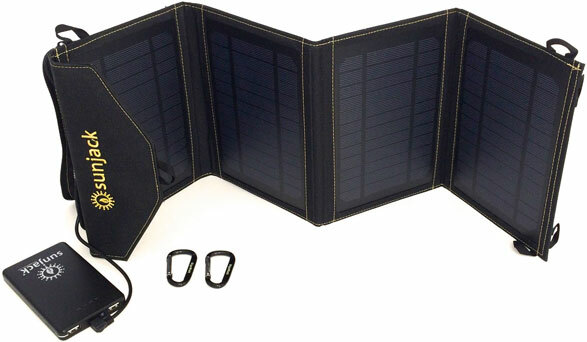 The product kit comes with an 8000 mAh battery, which can be charged up in around 5 hours, via the power socket (the sun probably takes longer we guess via the 14 watt of solar panels). The charger unit is pretty lightweight and folds easily to make it ultra-portable. It also sports two hooks for when you want to hang it in direct sunlight. This gadget can charge up to two devices at the same time by utilizing two different USB ports (up to 2A). The SunJack Phone Portable Solar Charger is available for $150 via TheSunJack.